Responsive and mobile friendly websites optimised for iPhones, iPad’s and tablets. 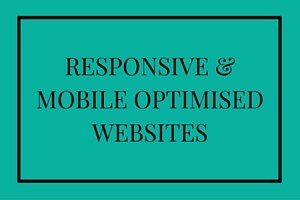 Why is a responsive/mobile optimised website so important? Gone are the days when only the biggest businesses really needed a site that looked good on mobile devices. On April 21st, 2015 Google confirmed that mobile responsiveness was about to become a major ranking factor – Google rarely comes out and says directly what criteria they use to rank sites so when they do, it is certainly worth paying attention. Sites that are non-mobile-friendly have since been dropping from mobile search results at a rapid pace. If you are at all concerned about your SEO performance then making sure your website is responsive is now absolutely vital. Over half of all searches are now carried out on a mobile device and for certain types of business, this number will be significantly greater. If you want to rank well with Google and if you want to offer your visitors the best user experience, then you absolutely need a responsive, mobile-friendly website. Be wary of any website designer or website design agency that suggests mobile responsiveness as just an option. It’s an easy way to justify an additional cost, but the reality is that no trustworthy designer who wants their clients’ sites to rank well would even suggest a site that wasn’t responsive to mobiles and tablets. Contact me to speak further about responsive website design and to learn more about why a mobile friendly site should be considered a necessity. That’s a lot of people who will be frustrated with your website if they have to pinch and zoom around their screen to find what they are looking for! Mobile users tend to abandon websites within 3 seconds if the page fails to load. Sites built by The Original Wordsmith are built for speed! Not everyone is aware of the importance of mobile responsiveness. If this applies to your competitors then you are in an even stronger position to make your website mobile friendly and rapidly outperform them.